E. Christian Kopff, classicist at the University of Colorado and occasional contributor to The Occidental Quarterly, has the knack of writing about difficult issues with an easy grace. The book under review is first of all a defense for our time of the value of classical learning. On the way, he includes much sound advice for actual or prospective parents, a few biographical sketches, and comments on the contemporary humanities and the American cinema. In the curricular wars of the 1980s and 1990s, most self-described conservatives saw themselves as combating “the legacy of the sixties.” But from long before the sixties there radiates still the baleful influence of John Dewey. And before him stands President Charles Eliot of Harvard with his elective system to replace the traditional program of studies in Latin and Greek. In reality, as Kopff explains, the problems with our educational establishments go all the way back to the Enlightenment. The central fallacy of the Enlightenment was that tradition constituted a burden upon the present generation, limiting its possibilities. The “enlightened” philosopher sought to make a new beginning, as when Descartes declared he would write “as if no one had written on these matters before”; or as when Rousseau began an argument with: “let us put the facts aside; they have nothing to do with the case.” The underlying notion is similar to one I have heard from young would-be writers and artists: they must avoid studying past works in their genres because that would limit their “originality.” Of course, if we carry this thought to its logical conclusion, we arrive at a cult of ignorance as the path to discovery and achievement. And the appropriation of a heritage is itself a demanding task: it cannot be passively received like a gift. “Acquire what you have obtained from your fathers if you would possess it!” said Goethe. The view of education Kopff champions is that of Albert Jay Nock as expounded in his 1931 Page-Barbour Lectures at the University of Virginia (published as Theory of Education in the United States). Nock’s educational thought rests upon a fundamental distinction between education and training. Training means the learning of information relevant to the accomplishment of specific goals. Education in the proper sense refers to the study and mastery of a body of knowledge formative in character: formative, that is, of the learner himself. Genuine education aims at producing thoughtful men who have at their disposal a wealth of general knowledge, and who, in the light of this knowledge, can judge matters of significance in a disinterested manner. Beginning in the 1890s, says Kopff, the ideal of those in charge of instructing the young shifted from education to training. First on the reformers’ list of useless courses were Latin and Greek. But, as classicist Paul Shorey recognized in 1917, the “dead” languages were from the start mere pretexts; the reformers had no more use for Shakespeare or Milton than for Homer or Virgil. There is a straight line from the introduction of the elective system, made possible by the banishment of Greek and Latin, to the current multicultural ideal of sampling Lady Murasaki one day and the Mahabharata the next. Dr. Kopff is skeptical even of “Great Books” curricula, which he calls the “dime-store approach to education” or “civilization on the cheap” (p. 13). There is no substitute for mastery of the languages in which the books are written. Such a requirement will undoubtedly make it more difficult to find qualified teachers, but the teacher who sets out to fulfill it “will experience an increase in his self-respect as well as his humility—things in short supply in today’s teachers of the humanities” (p. 18). I suspect the abolition of rigorous Greek and Latin requirements has contributed to “science envy,” the source of much non-functional technicality and obfuscation in recent literary studies. 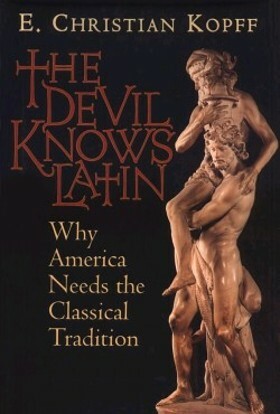 Indeed, as late as the 1960s, there were more than 700,000 Latin students in American high schools. But the torch was definitely dropped at that time. contemporary research confirms that the best time to begin the study of languages and math is before puberty. What the pupil learns of these subjects early will provide a firm foundation for any future course of study. English, for example, consists by more than 50 percent of words of Latin origin; and most of the sciences, however much their content may change over time, will always presuppose a good grounding in mathematics. Published: June 14, 2011 | This entry was posted in North American New Right and tagged book reviews, E. Christian Kopff, education, F. Roger Devlin, language, North American New Right, reprints, the classics, The Devil Knows Latin. Both comments and trackbacks are currently closed. Well, I’ve had this book on my ‘to read list’ for months. I think I ought to start reading it now. Meanwhile, I’m happy to say the attempt at banishing Latin and Greek has not succeeded; the rebirth of each is gradual and steady. These ancient languages transmit a priceless potency of communication. As a derivative example, the English language has a ‘bi-level’ way of communicating to an audience. For instance: if I want to appeal to someone’s ‘intellect’, I pick English words derived from Latin or Greek. By contrast: if I want to appeal to someone’s ‘heart’, I pick English words derived from Old German. Romance languages such as Spanish and Italian also have those same, historical constructions of adaptation. However, the English language is a superb champion at picking the right words for the right audience. En fin: was it plain ignorance or outright criminal intention against traditional education? I don’t know. However, language is the original force for the defence of a society against aggression. I enjoyed this article. Gratias maximas! As the educational mainstream continues its downward slide, the students quietly being given a classical education today (at home or in modest church schools) will one day be poised to form an intellectual elite within our nation. At last, someone gets it! Perhaps someone will take Book II of Uncle Adolf’s masterwork, and rewrite it to make it the foundation of a major section of such a curriculum. “Humanities” comes to mind. To learn Greek and Latin is of the utmost importance. These are not only languages, they are systems of thoughts, like music or mathematics. It is extremely important to give these tools to our young ones. Since the enlightenment it has been a constant ploy to try to deprive us of these wonders so as to cut the link with the roots of our tradition and culture. The enemy never stops in its efforts.